When we were getting ready to sell our late 1980’s vintage home we heard quite a few negative complaints on the fact that the washer and dryer were located in the basement. Most real estate agents and prospective home buyers wrinkled their noses when they learned of this apparently ugly fact, a laundry room in the basement. For my wife and me, we never really viewed it as a problem as we were comfortable in our home for more than a quarter of a century. Though a surprise concern for us, we were ultimately able to find a buyer for our house that accepted the basement laundry room. So from this learning experience, I would suggest that if you are thinking about someday selling your home, and it has a basement laundry room, you may want to think about raising it up to the first or second level of the home. One idea would be to convert another room in your home to a dedicated laundry room. For example, a mud room, den or small bedroom are viable areas for creating a dedicated laundry room. Ideally, try to select a room that already has plumbing in it, or at least has adjacent walls that can provide access to plumbing drain/vent stacks and supply lines. 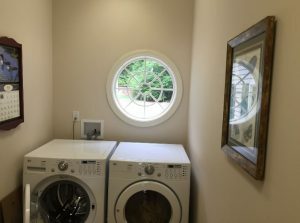 To meet today’s prospective home buyer’s expectation the laundry room design should include more than just space for the washer and dryer. It should also include a large deep sink and countertops, as well as floor and wall mounted cabinets to house detergents and other clothing cleaner products. Moreover, it should be spacious enough to enable soiled laundry to be comfortably stored in it, as well as clean clothes to be folded and ironed in it. Also think about including wall integrated dry clothing racks for those items that can be placed into a clothes dryer. When designing a laundry room think light colors and plenty of bright overhead lighting to make the small area feel bright and cheery. If possible, make sure at least one window can be included in the design. Also make sure the laundry room design includes a door so that you can shut out the noise from the washer and dryer when they’re operating, albeit the new ones are much quieter than their old predecessors. 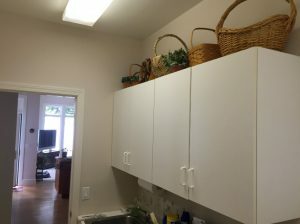 If room permits you can also potentially have the laundry room double as a pantry, or as a drop station for mail, keys, wallets and purses. So if you don’t want to eventually get caught in a real estate squeeze, if you have a basement laundry room, and have extra space on an upper level floor, seriously consider a dedicated laundry room conversion project. It will be well worth the investment for not only the future owners of your home, but for yourself as long as you live in the home.